Crystal meth is a common variant of the drug methamphetamine, a highly addictive stimulant made from dangerous chemical ingredients. Its name comes from its appearance, typically looking like chunks of clear crystal or shiny white rocks. It’s also known by the street names ice and glass. 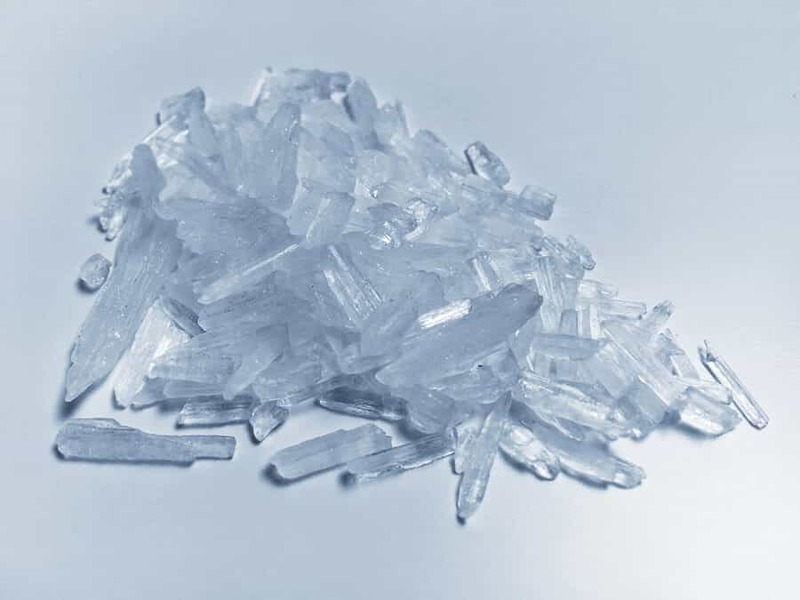 Crystal meth is typically smoked in a small pipe, but it can also be snorted, injected, or taken orally. Meth is known for its intense euphoric rush that fills the user with energy. The drug works by activating the release of dopamine in the brain, causing feelings of pleasure. It’s such an effective intoxicant that some of those who have become dependent on the drug report that they were addicted from the first high. It was even used in World War II to help keep soldiers awake. It’s also unique in that the feeling of the high can last for up to 12 hours, rather than quickly leaving the body as it does in other drugs. Users report feeling the urge to do anything to feel the rush of the meth high again. However, it’s common for users of drugs like meth to never be able to experience how they felt the first time they took the drug. Many try, and they soon find themselves addicted and facing severe withdrawal symptoms if they stop using the substance. Crystal meth is particularly devastating to the body and mind. Long-term use produces severe and dramatic health problems, and many of those who don’t find help die from the complications or from overdose. Meth abuse tends to quickly interfere with a user’s life. It’s not long before the individual becomes preoccupied with obtaining the drug and being able to take it as much as possible. Daily responsibilities and relationships suffer. Once a person starts to see serious consequences of drug use but is unable to or unwilling to quit, that’s when you know dependence has taken hold. The next step is physical addiction, which also develops rapidly in powerful street drugs like crystal meth. Physical addiction happens when the brain and body change in order to accommodate the foreign substance and its effects to the point that ceasing use produces withdrawal symptoms. Crystal meth withdrawal is mostly based around its activation of dopamine in the brain. When a foreign substance causes the massive release of something like dopamine in the brain, the brain stops producing that chemical on its own in an attempt to compensate. Therefore, when a long-term user of meth stops taking the drug, the brain finds itself with no dopamine. This creates a condition referred to as anhedonia, or the inability to feel pleasure. Things that would make an average person feel good, like a hot bath, a delicious meal, or a loving embrace, can cause no reaction in someone recovering from crystal meth addiction. It’s therefore not surprising that it’s considered to be one of the most difficult addictions to treat. Due to depression and a general inability to feel pleasure that can last for weeks or months after quitting, those recovering from meth addiction should be observed for signs of suicidal ideation. The most common symptom is, of course, craving the drug. In one study of 32 individuals who were addicted to methamphetamine and put through a period of abstinence, 70 percent of the subjects reported cravings as soon as the study began. Though cravings and most other symptoms fade after 2-3 weeks, it can take up to two years for dopamine production and receptors in the brain to return to normal. Crystal meth is one of the worst drugs you can take in terms of physical and mental health. Not only is the base substance harmful, crystal meth is never pure. It’s always mixed with other dangerous chemicals that you would never ingest on their own. The fact that the effects of meth are so intense and long-lasting means they can do significant damage to the brain. The effects can be seen within just a couple months of abuse. Mood and behavioral changes are common and extreme enough that the user can seem to be a completely different person. Mood swings, angry outbursts, and violent behavior come along with the increase in energy. Insomnia, severe anxiety, and confusion may also occur. As damage progresses, the addicted individual will display more severe psychological symptoms, including paranoia, hallucinations, and delusions. You often hear of meth users feeling as though bugs are crawling all over their skin even if nothing is there. Some of the more disturbing effects of meth abuse are long-term psychosis symptoms. These can persist for months or years after an individual has stopped taking meth, and even after that, stress can cause these symptoms to spontaneously reappear. Brain scans of people who have used meth show significant changes in structure and activity around key areas that cause these extreme symptoms. The entire dopamine system of an addicted person who has been abstinent for one month is depressed, showing very low activity. Not only does this affect mood and the ability to feel pleasure, it also reduces motor speed and verbal learning skills. Structural changes are also seen in other areas associated with emotion regulation as well as memory. Some of these changes are reversible; however, some are not. The most common physical effects of meth are severe tooth damage and decay, often from a combination of a lack of dental hygiene, poor nutrition, and teeth grinding. Compulsive picking at the skin results in numerous skin sores that can cause scarring. Overdose is also a growing concern. According to a Drug Abuse Warning Network report, meth-related emergency room visits rose by over 35,000 from 2007 to 2011. Due to the low impulse control and needle-sharing associated with crystal meth abuse, addicted individuals are also at a higher risk for contracting dangerous diseases like HIV and hepatitis B and C. At the same time, meth use can worsen the progression and complications of HIV/AIDS. Methamphetamine addiction can be a tough disorder to treat; however, recovery is possible. The powerful cravings can be all-consuming, and treatment is often complicated by the fact that many of those who end up addicted to crystal meth are living in poverty. Unlike with some other intoxicants, there are no FDA-approved medications available to treat meth cravings and addiction, though preliminary research showed promising results for off-label use of a drug used to treat alcoholism. According to the National Institute on Drug Abuse, the most effective treatment for addiction to this substance is behavioral therapy in both individual and group settings combined with 12-Step programs and family education. Regular drug testing should be used to keep an eye out for relapse. Twelve-Step programs also help to encourage activities that can bring joy and fill up time that would normally be used to obtain and use meth. Another treatment method that has proven effective for people addicted to methamphetamine and cocaine is the Motivational Incentives for Enhancing Drug Abuse Recovery (MIEDAR) program. A kind of Motivational Interviewing, this program involves providing incentives for addicted individuals to stay abstinent and attend therapy and support meetings, while there can be punishments and sanctions for negative behavior. Incentives can include vouchers given for negative drug tests that can be exchanged for goods, money, or a chance to win large prizes. Evidence-based tests have shown this method to be effective. In one study, treatment retention rates were at 50% for the group that received incentives for abstinence compared to 35% for those that did not. Due to the intense cravings and high potential for relapse with meth addiction, inpatient rehab is highly recommended. This typically consists of staying in an addiction treatment facility for several weeks with only controlled access to the outside world and no substances except those prescribed by a doctor. Therapy sessions and support group meetings are held within the facility, including any necessary classes on how to resist temptation and deal with life stresses that can trigger cravings. For those addicted to crystal meth, it may be necessary to help them learn essential job skills and help them discover new hobbies they can enjoy. There are many treatment centers available to address crystal meth addiction due to rising rates of abuse and increased attention on the drug due to its devastating effects. Recovery is always possible for anyone who wishes to seek treatment.